I don’t know about you, but I have a problem with my armpits sweating. Sometimes just putting on a roll-on or antiperspirant spray automatically gets the sweat glands going and I start to sweat, without even doing any physical activity. It’s terribly annoying! 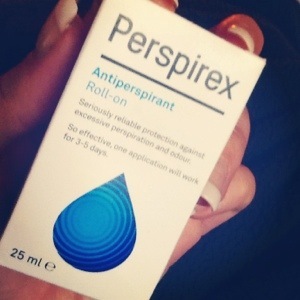 Recently I’ve been using PERSPIREX and I can honestly say its the BEST roll-on ever! No more sweat! Yay! 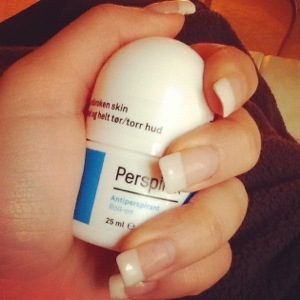 You use PERSPIREX at night before bed, because your sweat glands are less active at night. In the morning you wash it off and you don’t have to re-apply. I use it about 2-3 times a week as recommended. 2 strokes up and down is enough! It’s not like the normal roll-on where you constantly rolling it up and down in fear of sweating. It’s a small bottle (25ml) and costed about R130,00 from Dischem. It may seem expensive, but you use so little of it, that it will last you a seriously long time. It can get itchy, but that’s only because you may have applied it to your skin when it wasn’t fully dry, or you’ve applied too much. I really love it, because you only need it about 2-3 times a week. Without having to use anything else other than your perfume! I don’t use any other roll-on or sprays! Nada! That’s just amazing! Plus it’s tested on human volunteers only and is made in Denmark! 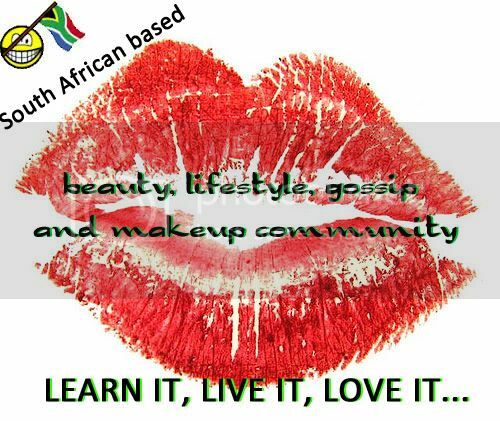 A product I am trusting big time! So if you have a sweaty problem, please try this product out. They even have a lotion for your feet! Lucky for me I don’t suffer from that problem. I just thought I’d tell you about a product I personally love and feel truly works!